How transparency can be brought into the policymaking process. a location derived by understanding the complexities of parameters like transportation networks, population density, urbanization and other land use patterns. Policy decisions such as this involve opinions, information, knowledge from multiple groups such as urban planners, governing bodies, citizen groups etc. When there is a collective decision making process such as this, there should a platform to share the public data, help decision making and provide the analytics framework and the results. OSM is a platform to share data, but FOSS4G groups such as OSGeo is trying to develop platforms like Geoserver and Open Geonetwork for analyzing the spatial data and acting as meta data catalogues. But these technologies still have a long journey to make in order strong entry into the policy making especially in countries like India. Anyhow an attempt can be made to briefly understand the complexities involved in policy making and how maps become a good visual medium for citizens to understand the results of the decisions taken. 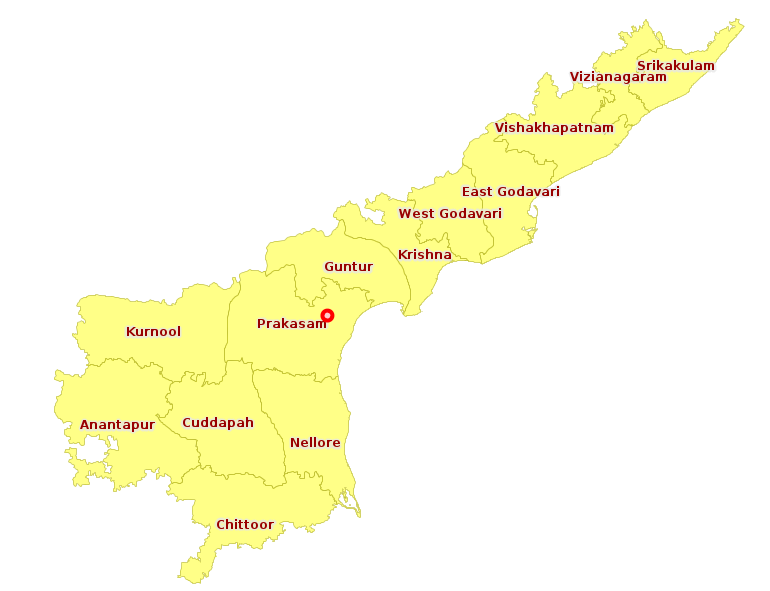 In the case study that we are looking at, the capital city could be located at the geometric center of the state as discussed earlier. 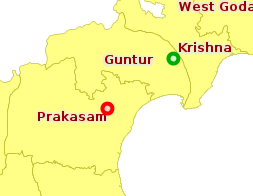 As shown in the map, the geometric center of the new state falls in the Prakasam district. But considering geometric center as a capital city might not be a feasible solution as other criteria such as availability of social and physical infrastructure might have to be taken into consideration. Also land use of the location, soil characteristics, flood etc have to be taken into account. Accessibility of the new location to majority population should also be considered. In the second scenario, if center of state is defined by using population as a parameter rather than distance, then the location of capital might change. Population distribution maps are not readily available in the open domain. Though CIESIN provides population distribution based on land use , for this case study the OSM data of places(human settlements) is used as a proxy for understanding the population density. It is also assumed that human settlements act as a good indicator for social and physical infrastructure. 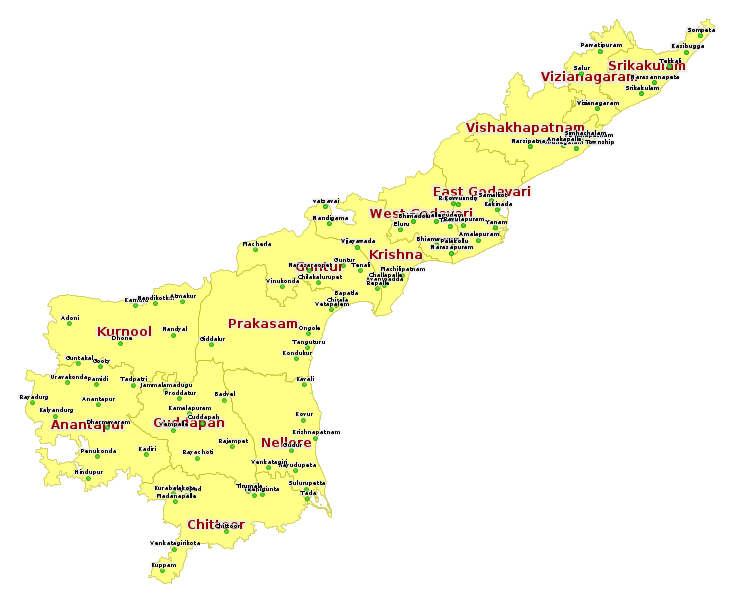 State of Andhra Pradesh is divided into grids and density of human settlements is calculated in each grid. More the density more the population and better the social and physical infra is what is assumed here. This map shows the density of human settlements in each grid. The grids in the coastal areas are having more density probably due to availability of natural resources. Considering this density as a proxy for population, center is calculated from the weights of these grids. 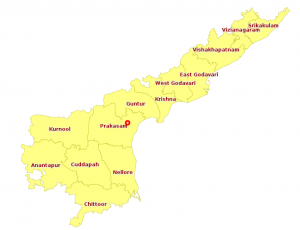 This approach leads to a shift of probable capital to North East into Guntur district, as the population density is more towards the deltas when compared to the plateau region. This analysis could further be refined by adding other parameters such as land use. This analysis can become more meaningful if land use data from Bhuvan of NRSC is used. Parameters like accessibility, social and physical infrastructure are important in this decision making process, but the impacts to environment and socio-economics of the region surrounding should also be evaluated for sustainable development. Technology is one part in an exercise like this, the other major part being transparency. It is very important for governments to share this decision making process, the information used to take the decisions with the citizens. KAIINOS is working with groups like OSGeo India to provide solutions in the domain of governance for sustainable development with a vision of bringing in transparency through technology.